Mars, for example, has geological features that suggest it once had—and still has—subsurface liquid water, an almost sure prerequisite for life. Scientists have also eyed Saturn's moons Titan and Enceladus as well as Jupiter's moons Europa, Ganymede and Callisto as possible havens for life in the oceans under their icy crusts. In a paper published online today (March 30, 2018) in the journal Astrobiology, an international team of researchers led by planetary scientist Sanjay Limaye of the University of Wisconsin–Madison's Space Science and Engineering Center lays out a case for the atmosphere of Venus as a possible niche for extraterrestrial microbial life. "Venus has had plenty of time to evolve life on its own," explains Limaye, noting that some models suggest Venus once had a habitable climate with liquid water on its surface for as long as 2 billion years. "That's much longer than is believed to have occurred on Mars." On Earth, terrestrial microorganisms—mostly bacteria—are capable of being swept into the atmosphere, where they have been found alive at altitudes as high as 41 kilometers (25 miles) by scientists using specially equipped balloons, according to study co-author David J. Smith of NASA's Ames Research Center. "On Earth, we know that life can thrive in very acidic conditions, can feed on carbon dioxide, and produce sulfuric acid," says Rakesh Mogul, a professor of biological chemistry at California State Polytechnic University, Pomona, and a co-author on the new paper. He notes that the cloudy, highly reflective and acidic atmosphere of Venus is composed mostly of carbon dioxide and water droplets containing sulfuric acid. The habitability of Venus' clouds was first raised in 1967 by noted biophysicist Harold Morowitz and famed astronomer Carl Sagan. Decades later, the planetary scientists David Grinspoon, Mark Bullock and their colleagues expanded on the idea. Supporting the notion that Venus' atmosphere could be a plausible niche for life, a series of space probes to the planet launched between 1962 and 1978 showed that the temperature and pressure conditions in the lower and middle portions of the Venusian atmosphere—altitudes between 40 and 60 kilometers (25–27 miles)—would not preclude microbial life. The surface conditions on the planet, however, are known to be inhospitable, with temperatures soaring above 450 degrees Celsius (860 degrees Fahrenheit). Limaye, who conducts his research as a NASA participating scientist in the Japan Aerospace Exploration Agency's Akatsuki mission to Venus, was eager to revisit the idea of exploring the planet's atmosphere after a chance meeting at a teachers' workshop with paper co-author Grzegorz Słowik of Poland's University of Zielona Góra. Slowik made him aware of bacteria on Earth with light-absorbing properties similar to those of unidentified particles that make up unexplained dark patches observed in the clouds of Venus. Spectroscopic observations, particularly in the ultraviolet, show that the dark patches are composed of concentrated sulfuric acid and other unknown light-absorbing particles. "Venus shows some episodic dark, sulfuric rich patches, with contrasts up to 30–40 percent in the ultraviolet, and muted in longer wavelengths. These patches persist for days, changing their shape and contrasts continuously and appear to be scale dependent," says Limaye. The particles that make up the dark patches have almost the same dimensions as some bacteria on Earth, although the instruments that have sampled Venus' atmosphere to date are incapable of distinguishing between materials of an organic or inorganic nature. The patches could be something akin to the algae blooms that occur routinely in the lakes and oceans of Earth, according to Limaye and Mogul—only these would need to be sustained in the Venusian atmosphere. Limaye notes, however, that a part of the equation that isn't known is when Venus' liquid water evaporated—extensive lava flows in the last billion years likely have either destroyed or covered up the planet's earlier terrestrial history. In the hunt for extraterrestrial life, planetary atmospheres other than Earth's remain largely unexplored. 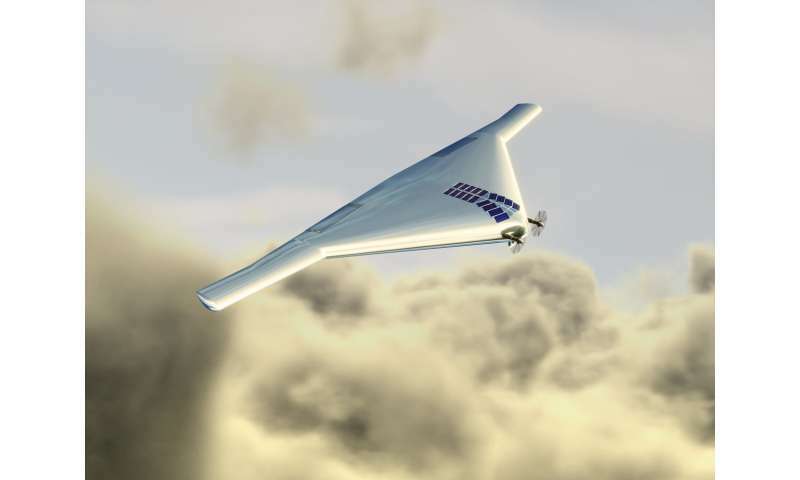 One possibility for sampling the clouds of Venus, says Limaye, is on the drawing board: VAMP, or Venus Atmospheric Maneuverable Platform, a craft that flies like a plane but floats like a blimp and could stay aloft in the planet's cloud layer for up to a year gathering data and samples. "To really know, we need to go there and sample the clouds," says Mogul. "Venus could be an exciting new chapter in astrobiology exploration." The Wisconsin scientist and his colleagues remain hopeful that such a chapter can be opened as there are ongoing discussions about possible NASA participation in Russia's Roscosmos Venera-D mission, now slated for the late 2020s. Current plans for Venera-D might include an orbiter, a lander and a NASA-contributed surface station and maneuverable aerial platform. Decades ago, sixties? Analog Science Fact/Fiction had an article about an astronomer who had correlated bacteria on astronomical plates with the relative position of Venus. The idea was that the bacteria could be carried by the solar wind. Of course, when these bacteria were discovered, they were dead, from the development of the photographic plates if nothing else. But it would take just one getting across in millions of years for Venus to be the source of life on Earth. We know that, as Earth was cooling down from its creation, the event forming the moon would have extended the time that earth's surface was molten. So it is certainly possible that life on Earth started on Venus. Same for Mars*, and even outer planet moons. Panspermia with a vengeance. * Mars and Mercury were probably the first planets to form solid crusts. But that doesn't mean that Mars (or Mercury) ever had the conditions needed for life to form. However life could survive on Mars once it arrived. I have made my skepticism of the Panspermia fantasy quite clear. And willfully ridicule the delusion of Earth Life or Alien drifting around beyond the Earth's mesosphere. However, I am of the opinion, that it is not unreasonable to speculate. That if Earth Life such as spores, were projected into space by volcanic explosions or large asteroid strikes? It might be possible, if implausible. That those extremophiles may be dragged inward towards the Sun. To be captured enroute by Venus? Possibly that some of those survive, maybe thrive, in the upper atmosphere of Venus? The important question would be if there is sufficient water to sustain those micro-organisms? Whatever the case, we should develop some bacteria that can survive in Venus' atmosphere, but can also munch through its layers to terraform it.. or at least get rid of the excess of atmosphere! Life lives in the volcanic vents on the Marianas trench living entirely on the sulphurs coming out the vents so it just remotely possible, but life evolved from the sea for a few to live of the vents which is not possible on Venus which the remotely possible become the impossible. A good place to start might be ridding excess carbon from our own. If we claim we're doing it as practice for conquering another planet, we might even get government and industry support for it. eachus wrote: "Decades ago, sixties? Analog Science Fact/Fiction had an article about an astronomer who had correlated bacteria on astronomical plates with the relative position of Venus." Perhaps more to the point, G. Harry Stine wrote (Also in Analog, and about that same timeframe) that it ought to be possible to genetically engineer a blue-green algae that would metabolize H2SO4 and CO2 into H2O and O2 and S. Spray it into the cloudtops using a machine very much like this. It would take centuries - but it might be possible to terraform Venus. There really is not, despite the hype, all that much CO2 in Earth's atmosphere, which is about 78% nitrogen, 21% oxygen, and generally under 1% "all other gases". CO2 is not even the most common of the "all others". The atmosphere of Venus is 96% CO2, 3% nitrogen, and 1% "others". sirdumpalot, IMHO, that is a very risky, but potentially excellent idea. However, Carl Sagan beat you to the punch by about 57 years. Even with a perfect atmosphere somehow formed on Venus, which is well beyond our capabilities, Venus would still have very serious terraforming problems. The sunlight there is twice as strong and a single (sidereal) day on Venus takes about 4 months (116.75 days). A planetary-sized structure might be required to create more Earth-like conditions. It is good to contemplate terraforming Venus because when you are done you will realize terraforming Mars is going to be a walk in the park compared to terraforming Venus. Regarding life on Venus, the only way to be certain is to go there. VAMP sounds like a great idea to me. If it does not give us a definitive answer regarding microbes, at least it would be a good start. Life on earth surely evolved under mild conditions of temperature and chemistry. Its enormous chemical complexity would tend to rule out formation in very harsh conditions, which would prevent critical interactions of large molecular complexes, just for starters. That we have life that survives in harsh conditions does not in any way suggest it would, or could, have started there. It simply managed, over long periods, to slowly evolve mechanisms to invade such places. Life's existence (or not) is all in the chemistry, and temperature. The biochemistry that drives life is a vast, delicate web of reactions that have a very limited ability to adapt. Throw in too much salt, too many elements which hog electrons, etc. etc., thermal extremes, and you have a sterile zone. The barriers are so numerous that it is easier to state what is required, not what "might" provide for its formation. Life arising somewhere else and transported to Earth is possible, but totally unnecessary to explain its existence here. Indeed, the concept is comical. If it arose on Venus and Mars, it surely would have arose here too. "Random" Interplanetary transport is a fantasy that should be left with children. Most of these astro-biologists, like most people, have no idea how complex life is. People are so jaded by its common appearance on earth that its chemical complexity is trivialized, or more likely, completely unknown to them. Some biochemists spend many years trying to understand a single metabolic process from the thousands that exist. Defining the chemistry that gave rise to life on earth would make the study of quantum electrodynamics look like a game of checkers. I suspect Feynman would agree. ". . . most people, have no idea how complex life is. People are so jaded by its common appearance on earth that its chemical complexity is trivialized, or more likely, completely unknown to them"
I am reminded that the plants we keep in our office or gardens are vastly more complex than our best supercomputers. As advanced as we are, I find it humbling that we still don't fully understand photosynthesis. For example, practical artificial photosynthesis has not been achieved. The fact that there is so much more to learn is just another one of the thousands of pieces of evidence telling us that it would be foolish to stop exploring. That this is possible naturally begs the question. Should farts be redefined as a sort of living community, a heterogeneous cloud of living, single celled organisms acting in concert beyond merely stinking up the immediate environment? Could it be their producing excess gasses in our intestines and the intestines of all creatures an evolutionary adaptation to living in self-contained habitats cut off from the rest of their kind? By forcing their various habitats to expel foul smelling miasmas they have found a way to way of travel much further by utilizing air transportation instead of relying on hand, land or even water transport. gv5, good questions. I'm guessing the important difference is the mass of the planets. Even as far distant from the Sun as Mars is located. It does not have the mass to hold onto either enough atmosphere or water vapor to sustain a biosphere. Venus held on to too much of it's primordial gases. Everyone ignores Luna as the embarrassing evidence against the speculations that planet + goldilock's zone must be a habitable world. If Luna, was not the Earth's satellite? It would qualify as a rocky world in it's own right. Located in the middle of the g zone, with a stable orbit around a stable star? It would still be dead. I hate to use the words but we have to adopt a conservative skepticism about EVERY claim of discovering Living Worlds by long-distance observation. There is to much opportunity for falsifying evidence to gain headlines and accolades. The Public will feel betrayed and react with great anger if they come to believe that they are the victims of a hoax. A gram of exploration is worth a thousand tons of speculation. Admirable sentiments, Ludwig. However you will need to clearly state 'How" you intend to explore. How do you fund such efforts? How do you plan & organize an expedition? What technology and skillsets are available to make such an expedition a physical reality? Who makes the decisions setting the goals for exploration? How will you verify the accuracy and completeness of data collected? How will you moderate Public expectations of heroic conquests? When things go right, who shares the credit? When things go wrong, who will be your scapegoat? These are not unreasonable questions, with which to begin your preliminary efforts. @rrwillsj, the only way to fund and organize these projects is the way we do it now. Minimal $ with max returns. Accuracy and completeness of data collected is as always - The best we can do with what we have. Your remaining questions are vacuous. Who cares what the public thinks? Most of them have an attention span requiring an atomic clock to measure. Robotic probes are the only way to go. Sending people to other planets, when the one we are living on is collapsing is a colossal waste of effort and cash. But with over 7 billion people and screaming upward, there is little hope for it all. Might as well explore as much as we can for the kicks. Yeah, scientists get big kicks out of discovery, whether it provides useful data to the masses or not. It would be really weird if there were no other place with life in the Solar System, as Earth could have contaminated other places with it. It would mean there are really inhospitable places out there, or they are really isolated from us. Anyway, I think it is easier for life on Earth to go on an outer planet than on an inner one, due to higher planetary speeds closer to the Sun. rrwillsj, some of your questions are reasonable, but it is unreasonable to ask Ludwig to develop and lay the entire plan out for you. Perhaps you should take a shot at answering your own questions first. In a different comment thread I gave you what I believe is the most important part of the answer. Once you realize exploration is a journey there are only two choices, stop or keep going. The only choice that makes sense is to keep going. I see no insurmountable barriers to returning to the moon, exploring a number of asteroids and reaching Mars. But how are we going to reach the stars?, you previously asked. Again, that is for another time. We can't let the challenges of reaching the stars prevent us from taking that next step to Mars, etc. So how do I know this is the right answer? There are many reasons, but a particularly good one is "don't stop exploring" has always been the right answer! Any life ejected from earth's surface would have to survive the heat and pressures from the kinetics of such an event. Possible, but unlikely. Living organisms which survive such events would then have to survive extremes of heat and cold not seen on earth, potentially for millions of years as they drift through space in whatever direction. Then there are the cosmic rays and solar flares to contend with, which are devastating to complex biomolecules like DNA and RNA, to say the least. Dehydration (loss of water) would likely kill most organisms within a short period of time, even those exposed to moderate temperatures. It is simply not reasonable to assume that anything would survive for extended periods to reach a distant world. Only an advanced life form that prepared a vehicle to live in space would be capable of surviving such journeys. Surviving for extended periods on any local planet is another story with as many or more pitfalls. Simply not logical. Anytime a headline ends in a question mark, the answer is generally "No". 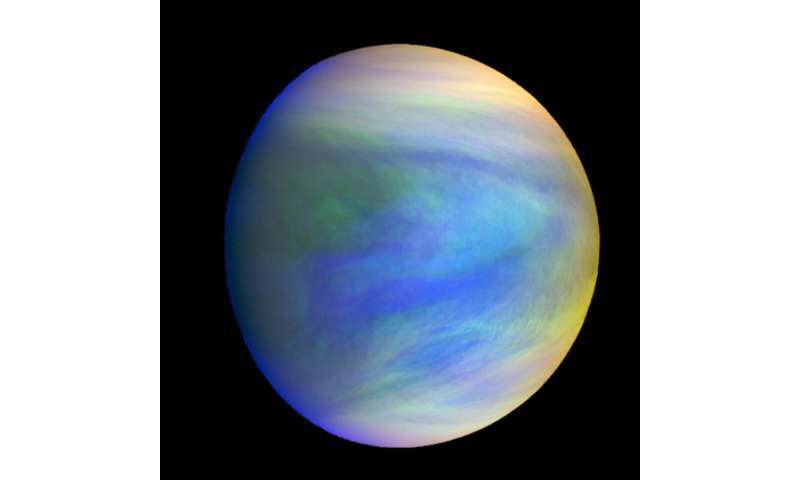 So, is there life adrift in the clouds of Venus? No. Cool blimp plane glider thingy, however. Launch it & do science. Definitely. dfjohnsonphd and Mark Thomas, thank you both for expressing many of my own opinions so well and so clearly. Your modest, conservative approach to space research & exploration is badly needed here. A sober skepticism for science based progress. The realiity is that we are all part of a society of conflicting multiple goals. If we fail to involve the Public? If we fail to oppose all the anti-science religious and the pseudo-science bunco artists? This society will be induced to turn on us. They will reject further scientific progress and legislate against their own best interests. Some might want to withdraw and continue their experiments in solitude? That was Newton and his clique of smuggery. Clutching their 'illuminate' wisdom to their bosoms and denying that the lower classes had any need for such knowledge. Amusing that it was the flamboyant Émilie du Châtelet who corrected Newton's bad latin and math errors. To popularize his genius. Available to all. I want to add a little to that thought. Even if getting the public involved were not required, it is an opportunity that should not be squandered. Dr. Zubrin likes to point out that the space program effectively doubled the numbers of people studying science at all levels from high school through Ph.D. Advancing the way we think may turn out to be the most important benefit of space exploration for a long time to come. rrwillsj, the "public" and especially the "anti-science religious and the pseudo-science bunco artists" have already turned on us. The empirical data for this is overwhelming. It is called Presidunce Chump. No other experimental data is required. We can even call it "Johnson's Law of Unequivocal Stupidity." And to all you anti-intelligentsia out there, realize that while many courts have overturned laws, science never has. This new law is here to stay. Live (better yet die) with it.